"A designer, whatever his views, has to embody, wholly if possible, the ideas and requirements of his client. This generally means, in most instances...multum in parvo." 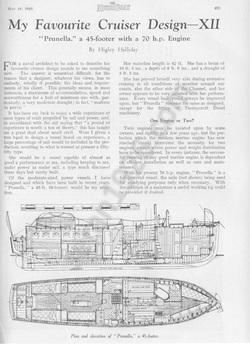 Halliday produced his earliest designs for motor yachts in the years preceding the First World War. The earliest surviving example is his design for the 40 ft. cruising motor yacht ‘Eclipse’ (1910), which was followed by ‘Amice’ (1912), a 36 ft. motor yacht designed for L. M. Waterhouse, a member of the British Motor Boat Club. 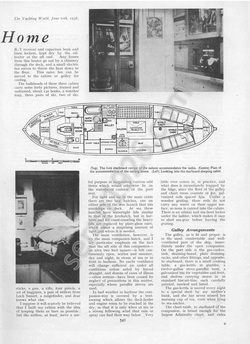 Halliday found his membership of, and close association with, the club provided a rich source of work particularly in the post war years, completing numerous motor yacht designs for club members including ‘Splash III’, Seawolf’, ‘Seran’, ‘Prunella’, ‘Sport’ and ‘Jennifer’ throughout the 1920’s. 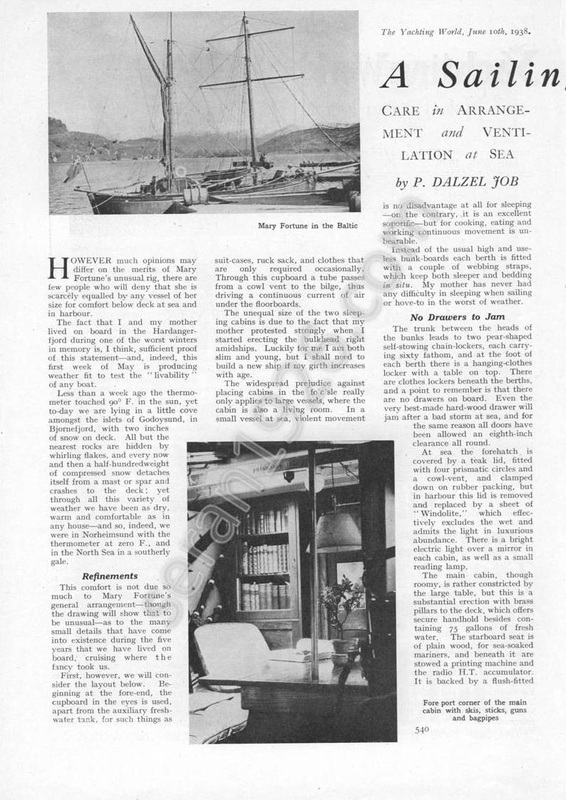 Halliday was the peak of his career in the 1920’s and it was his designs for bespoke, highly specified motor yachts which were reported in the yachting press of the day. In some respects his designs reflect the broader trends within the industry over this period, namely a shift from the highly specified and bespoke, toward the standardised, compact and affordable. 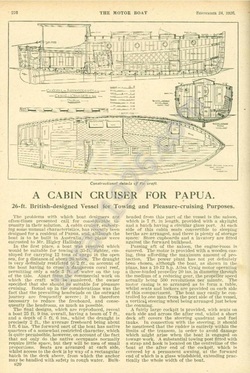 His designs to 1927 were typically of teak or mahogany construction, with no compromise on fit out or engine specification and almost exclusively built at Maynard’s yard. In the latter years of the 1920’s there was a shift to smaller craft, of 30 ft. overall or less, of cheaper, pitch pine construction and fitted with less highly specified engines; culminating with ‘Spray’ (1930) a standardised ‘everyman’s cruiser’, pitched at the mass market. 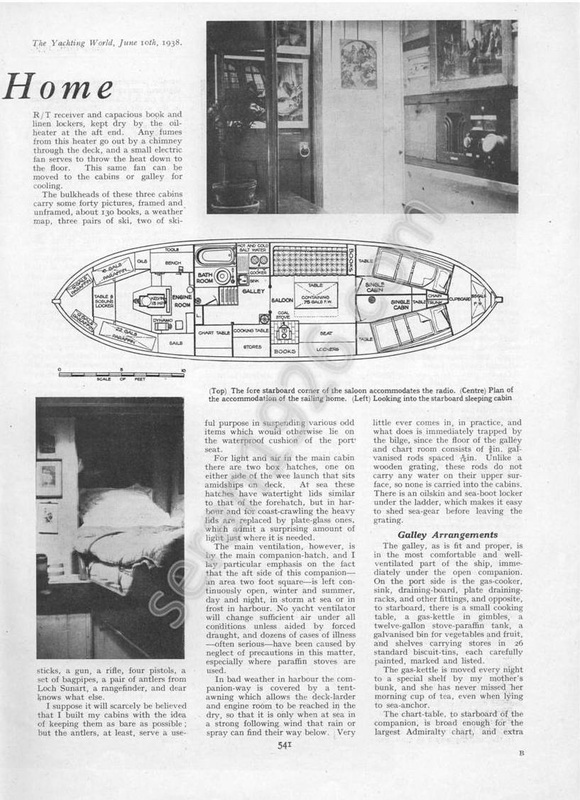 The following is a summary of motor yachts designed by Halliday, based on the Lloyd’s Registers of Yachts, contemporary magazine articles and surviving drawings. ‘Splash III’ was commissioned by A. J. Wilson, member of the British Motor Boat Club who, in 1906, had presented the club with the "A. J. Wilson Challenge Cup" for sea going cruisers. ‘Splash III’ was designed to 40 ft., of carvel timber construction and fitted with a single 6 cylinder engine. She entered a number of B.M.B.C. club races including meets on the Medway and Southend in 1920 and 1921. ‘Hope’ was designed for Dr E. W. Lowry a member of the Cruising Association and Royal Cruising Club. Built to 35 ft. she was of carvel, double skin mahogany construction, with an oak keel and fitted with a single 4 cylinder engine. Dr.Lowry took ‘Hope’ on cruises along the south and east coasts and crossing to Holland, prior to being re-engined by Mr. George Spicer in 1926 with a 6 cylinder Kermath engine, which afforded an estimated cruising speed of 9.5 knots. ‘Hope’ was reviewed by The Motor Boat, 25 June 1926, following the installation of the new Kermath engine. ‘Rosemary’ was commissioned by G. F. Mort, owner of the New Engine Co. Built to 38 ft., of carvel double skin mahogany construction, she was fitted with one of Mort’s 4 cylinder New Engine Co. paraffin engines. Halliday designed her for extended cruising through the French canals to the Mediterranean. 'Rosemary' was subsequently acquired by Miss S. M. D. Ryder who, with friends (Miss McEwan and latterly Miss Bagot), worked Rosemary back from the Mediterranean through the French canals to the UK between 1925 and 1929, the eventful journey being reported in The Times. 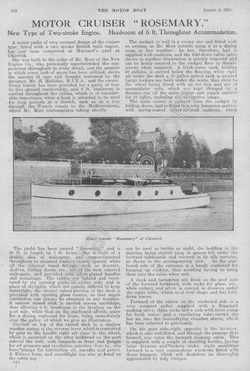 ‘Rosemary’ was reviewed by The Motor Boat, 5 August 1921. ‘Seawolf’ was designed for Alexander McCulloch, a British rower who won silver medal in the single sculls in the 1908 Olympic Games. McCulloch was also a member of the British Motor Boat Club. ‘Seawolf’ was designed to 45 ft., of carvel timber construction and fitted with twin 2 cylinder engines. ‘'Beowulf' was commissioned by Gerald R. Moxon, member of the Royal Thames Yacht Club, for river and coastal cruising with the ability to carry a mast and sail. 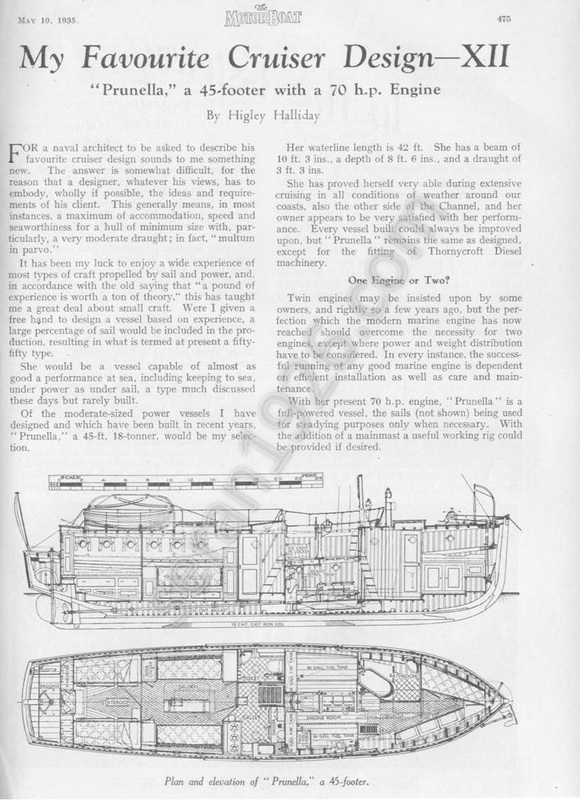 Halliday’s design was to 45 ft., of carvel, 1” teak plank construction fitted with a single 6 cylinder engine. In 1923 a cabin was added over the aft cockpit. 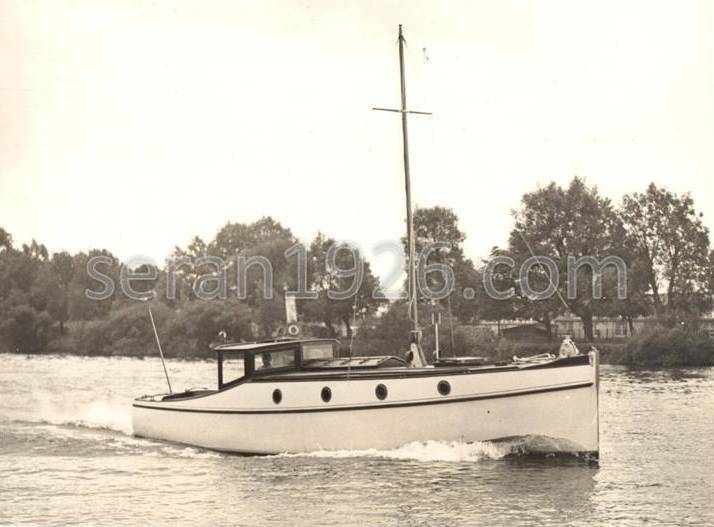 Interestingly, Moxon had previously owned the Linton Hope designed / Maynard built motor yacht 'Black Arrow' (ex 'Noah'), subsequently lost at Dunkirk in 1940. ‘Beowulf’ was reviewed by The Motor Boat, 2 June 1922. Commissioned by the St. Andrew's Waterside Church Mission, she was designed to 35 ft., of carvel timber construction and fitted with a single 6 cylinder Parsons petrol engine, affording an estimated cruising speed of 8.5 knots. ‘Venture’ was designed for W. A. Wood for coastal cruising and the French canals and was to be kept off Isle of Wight. She was originally designed to 25 ft. with an open cockpit, of carvel 3/4” teak plank construction. 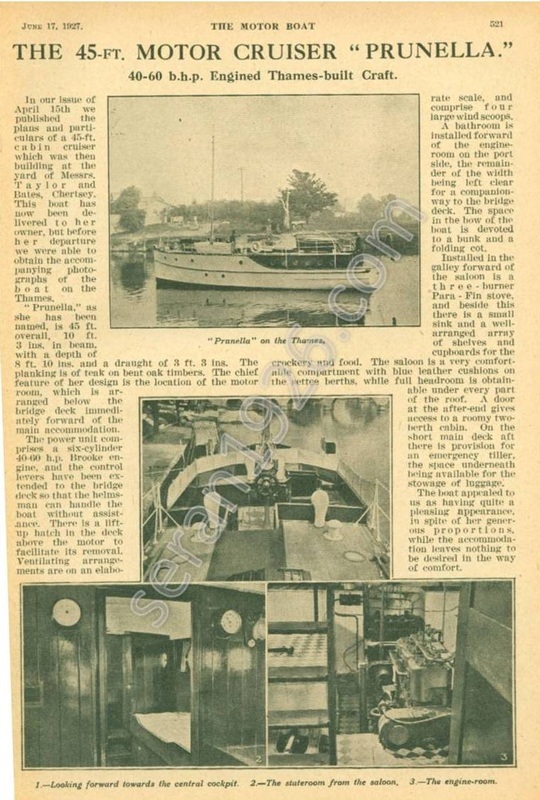 However in early 1927, she was extended 5 ft., a central wheelhouse and aft cabin were added, she was converted to twin screw with twin 2 cylinder Thornycroft petrol engines being installed. ‘Venture’ was pre-reviewed by The Motor Boat, 26 March 1926. ‘Seran’ was commissioned by Charles C. Regnart, President of Maple & Co. Ltd. and member of the British Motor Boat Club for coastal fishing trips and most likely cruising through the French canals. She was originally designed to 33 ft. but built to 35 ft., of carvel 1” teak plank construction and fitted with twin Ailsa Craig petrol / paraffin engines. She was re-constructed in 1934 by Frank Maynard, which involved extended her 5 ft. with the addition of the canoe stern and the addition of an enlarged wheelhouse and aft cabin. She was re-engined with twin Parsons four cylinder petrol engines. 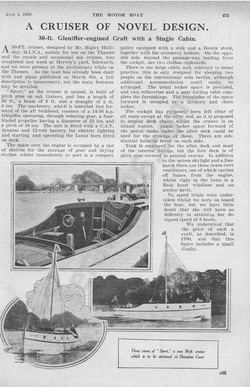 ‘Seran’ was reviewed by The Motor Boat, 10 September 1926. 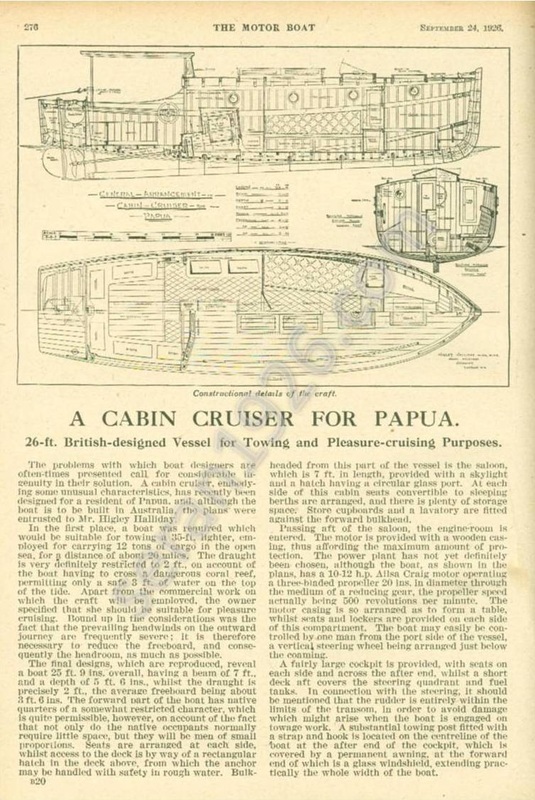 ‘Nanona’ was designed for W. H. Hughes of Mudan Plantation, Woodlark Island, Papua and rather than being built in Britain and shipped to Papua, the plans were passed to an Australian builder. Halliday was given very specific parameters and she was required for towing a 35 ft. lighter with 12 ton load, 20 miles across open sea off the coast of Papua New Guinea, the draught being restricted to 2 ft. in order to safely cross a coral reef. Halliday’s design was to 25 ft. of carvel, Oregon pine plank construction to be fitted with a single 4 cylinder Ailsa Craig petrol / paraffin engine. 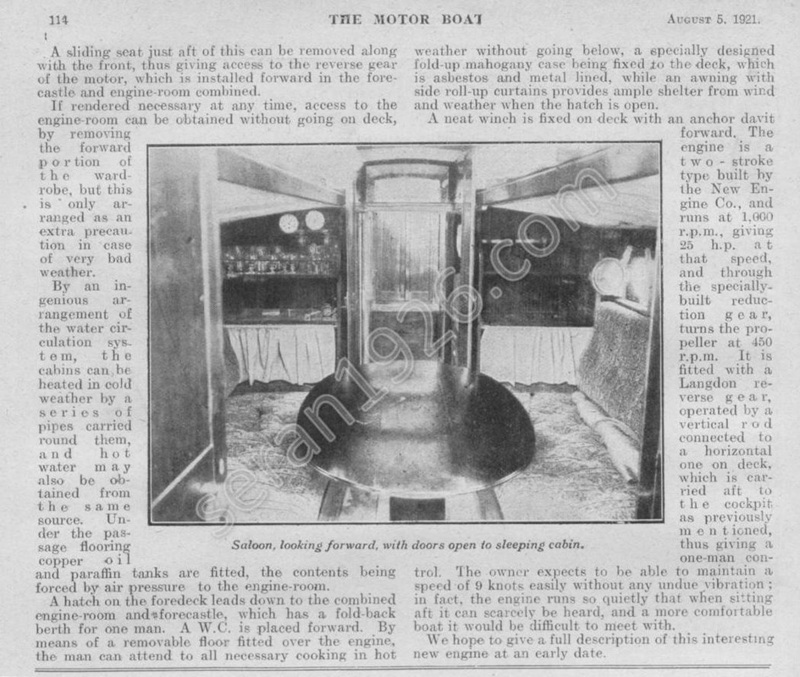 ‘Nanona’ was pre-reviewed by The Motor Boat, 24 September 1926. ‘Prunella’ was commissioned by F. H. Muirhead, member of the British Motor Boat Club and a designer and manufacturer of marine stabilisers. She was built to 45 ft., of carvel 1” teak plank construction and originally fitted with a single 6 cylinder Brooke petrol engine together with a mast for a steadying sail which could be rigged if required. Halliday was approached to make a number of minor modifications in 1928 and ‘Prunella’ was subsequently re-engined with a 70 h. p. Thornycroft engine in 1935. ‘Prunella’ was pre-reviewed by the Motor Boat, 15 April 1927 and after launch, 17 June 1927. 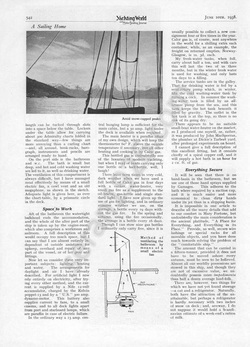 ‘Sport’ was designed for Harold L. Bromet, member of the British Motor Boat Club, for use principally on the Thames and therefore to comply with the Thames Conservancy Regulations. Built to 30 ft., of carvel 7/8" pitch pine plank construction and fitted with a single 4 cylinder Gleniffer petrol engine, her completed cost was £700. Her amidships section was based on ‘Seran’. At launch, ‘Sport’ had an estimated cruising speed of 8 knots. 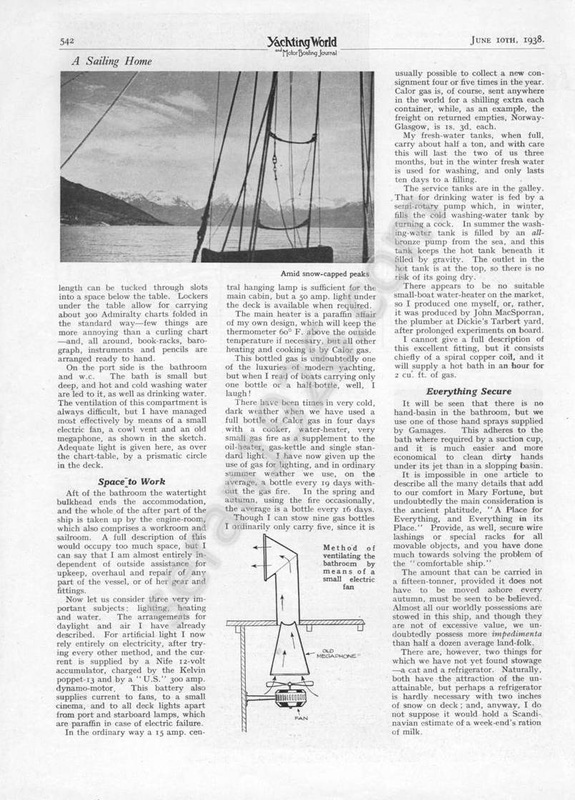 ‘Sport’ was pre-reviewed by the Motor Boat, 9 March 1928 and after launch, 1 June 1928. ‘Jennifer’ was commissioned by Eric C. A. Walker, member of the British Motor Boat Club, designed for coastal cruising and able to carry a mast and sail of 250 sq. ft. Built to 35 ft., of carvel timber construction and fitted with a single 4 cylinder petrol engine. In 1935 following a change of ownership, she was refurbished and re-named 'Nai Louis'. Following the death of her owner, she was gifted by his widow to the Solent Mission to Seamen in 1936 and dedicated by August of that year. Halliday designed the conversion of the 50 ft. pinnace, ex R.A.F. No. 83 (1920), for W. R. Wood a member of the British Motor Boat Club. ‘Cejoie’ was fitted with a 4T4 Gardner engine. The conversion was undertaken by Cox & King. ‘Spray’ was designed by Halliday as a basic, standardised motor yacht design intended to appeal to the mass market and with a completed cost not to exceed £395. She was built to 25 ft., of carvel 1/2” pine plank construction and fitted with a single Morris petrol engine affording a cruising speed of 9 knots. 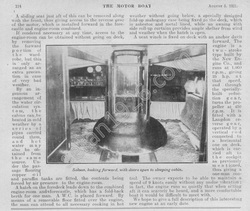 ‘Spray’ was pre-reviewed by The Motor Boat, 7 March 1930 and after launch. ‘Bendor’ was commissioned by A.E. Allen member of the Royal Norfolk and Suffolk Yacht Club. Built to 35 ft., of carvel timber construction and fitted with a 6 cylinder petrol engine. Little is known of her other than she was requisitioned in 1940 and took part in Operation Dynamo, returning home safely. ‘Karen II’ was designed for Captain F. L. Vaughan, member of the Royal Motor Yacht Club. 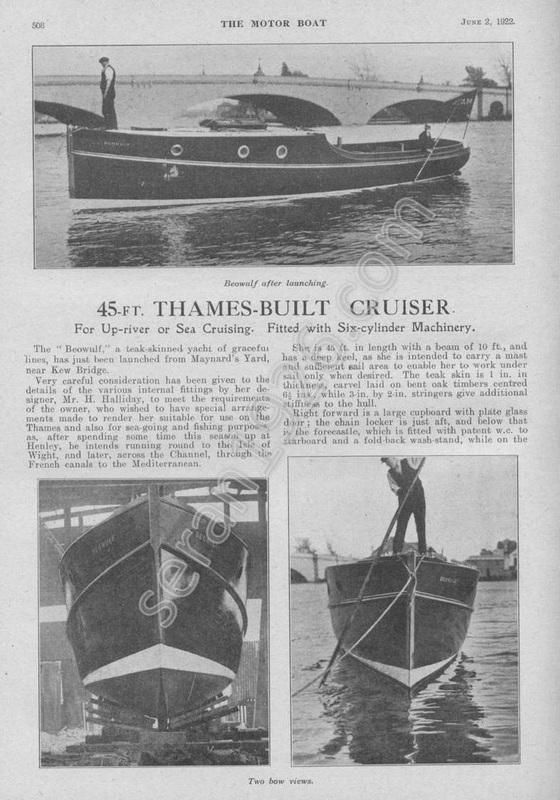 She was built to 37 ft., of timber carvel construction and fitted with twin 6 cylinder petrol engines. Like ‘Bendor’, she was requisitioned and took part in Operation Dynamo, returning home safely. 'Mary Fortune’ was commissioned by P. Dalzel Job, member of the Little Ship Club. A 37 ft. auxiliary schooner, she was a departure from Halliday’s typical design work. Dalzel Job sailed her extensively in the Norwegian fjords, Scandinavia and as far as arctic Russia by 1939. During the Second World War he commanded one of the naval teams led by Bond’s creator, Ian Fleming, in undercover raids in occupied Europe. Given his knowledge of the country, he was dispatched to Norway and was later awarded the Knight’s Cross of St Olaf, First Class, for his service to the Norwegian people. He is widely recognised as being the basis for Fleming’s creation, James Bond. 'Naromis’ was designed for R. J. Clutton, member of the Royal Thames Yacht Club, to 39 ft., of carvel timber construction and fitted with twin 4 cylinder engines. Re-named ‘Byeed’ she was last seen in Gibraltar in 1985 where she was undergoing a lengthy refit and taken on occasional trips across the straits to Ceuta or Algeciras. In the post war years Halliday completed several further designs including ‘Crest’ (1949) and ‘Diverx’ (1953).